Moving is kind of really expensive. Parker and I have lived in 4 different cities in under 3 years, so that's a lot of moving. Fortunately for us, moving doesn't cost us a cent since we are relocating on military orders. When Parker and I get the news that we are packing up and moving to a new city, we get really excited. The Navy packs us, loads up all our stuff, transports it, and unloads it in our new house. We are just responsible for getting ourselves to our new location, hardly anything worth complaining about. Well, since this last move was from Kingsville, TX to Corpus Christi, TX (just under an hour away), we had to move ourselves. Cue the complaining and whining about having to pack up our entire house and move it. I mean seriously, we have been so spoiled by the Navy that moving ourselves seemed less than enticing. However, if we were going to be forced to move ourselves, we were going to do it on the cheap. 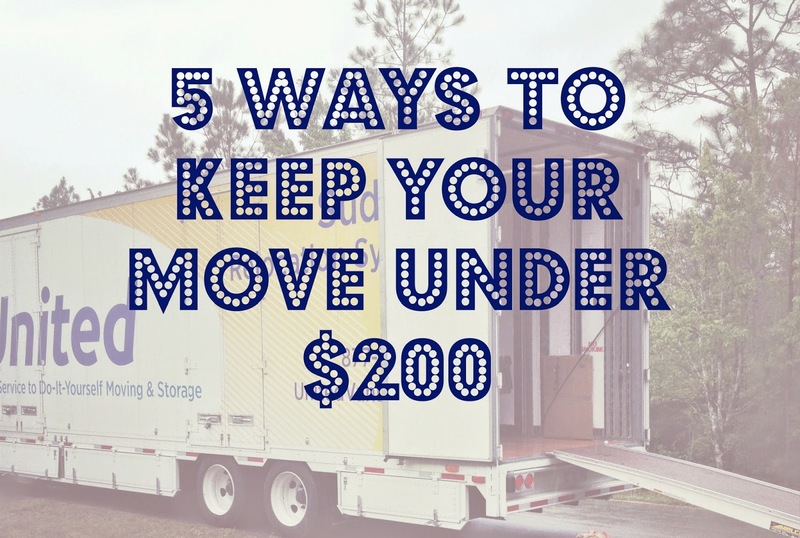 We have a house full of stuff and had to get it all from point A to point B, but we found some cost cutting solutions that kept our entire move under $200. 1. Boxes can be free. One of the most expensive parts of moving, if not the most expensive, is buying all the boxes. Those pieces of cardboard are not cheap! We could have easily spent several hundred dollars on new boxes, but we found a way around that. First, ask people who just moved for boxes. They are eager to get rid of them, so it's a win-win. If you don't know anyone who recently moved, then take a trip to your local Lowes and ask them for boxes. Huge shipments of merchandise come into these stores multiple times a week, and the boxes just get thrown away once the merchandise is unloaded. Parker went to Lowes one evening about an hour before they closed and came home with 20-30 boxes. The disadvantage of this route is that your boxes are all different sizes and harder to stack. The advantage? They are free. If you are moving far away and it's important to stack your boxes compactly, Lowes has the cheapest boxes to purchase as well. 2. 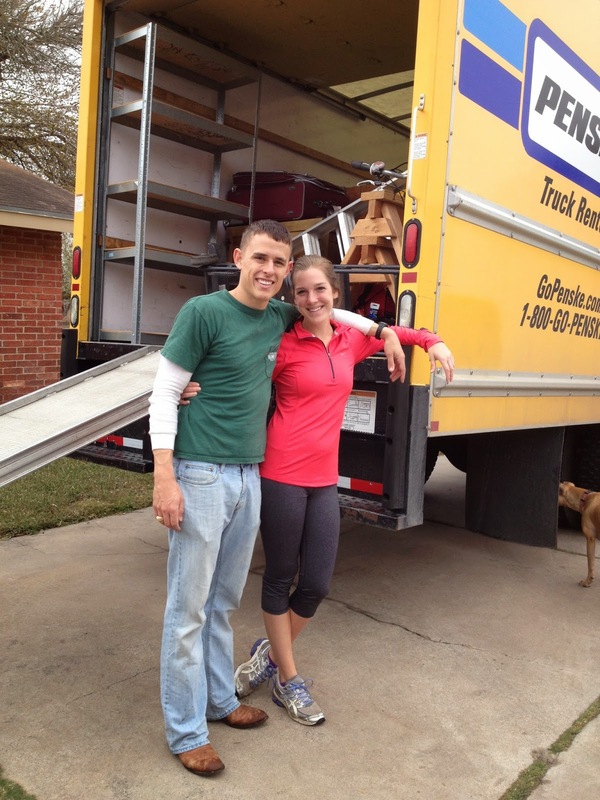 Renting a moving truck is like buying a car. It's negotiable. I found the very best deal online and then called the local Penske company in town. I told them the deal I found, and they matched it. We knocked $100 off of our moving truck because of this. 3. Blankets and towels can double as bubble wrap. You have to move all of those blankets and towels anyway, so why not use them to wrap some of the more fragile kitchen items? The trick to this is to pack the fragile items in smaller boxes, very compactly. I wrapped all of our drinking glasses in towels and packed them tightly together, and it kept them safe during the bumpy truck ride. 4. Pay your friends with pizza to help you load/unload. Loading and unloading is a pain, and we honestly couldn't have done it by ourselves if we wanted to. I am just not strong enough to help Parker lift the heavy furniture, so we needed man power, literally. We had a few friends help us pack up the truck in the morning in exchange for free breakfast burritos, and we paid people to help us unload that same afternoon with pizza. Much cheaper than paying movers, and who doesn't love a little free pizza? 5. Ask for help, and don't forget to have fun. Moving is fun. Yes, it's a pain in the rear end, but it's exciting to pack up and move to a new place. Don't focus so much on the work and stress that you forget to enjoy the process. This tip won't actually save you any money, but it could save your sanity. Ask your girlfriends to help you pack and have a girls night. If you're married, reminisce about all of the memories in your old home and talk about all the new ones you want to make in the next place. It's so easy to get frustrated and annoyed with each other when you're moving, but believe it or not, you'll actually realize packing up and moving was an enjoyable experience. Note: You won't realize this until it's been a few weeks, you're all unpacked, and the move isn't such a recent memory. I hope these tips are helpful to anyone with a move on the horizon. What could have cost us over $1000 cost us less than $200, and all it took was a little creative thinking. Have you ever moved yourself? Pleasant memory or horrible nightmare? So money savvy!! I haven't moved much and it sounds like pure torture.. Glad you guys get help from the Navy. Well deserved..! I've always moved myself, so the thought of the Army moving us in January is SO exciting to me. But yes! Free boxes...I always go early on a Tuesday (shipping day) to Lowe's and pick up a whole bunch of boxes :) I'm glad you guys managed to move for far less! We always do our moving on the cheap side too. There is no better way... Unless your company pays for it and does it all for you, in which case, yes please. I'm glad you found some friends to help you move and were able to do it cheaply! UGH! Spoiled is an understatement! haha! I've been thankful that the hubby sends me and the babies and dogs off to my parents while he deals with everything for the move and movers! It's been real nice! :) Glad you guys were able to get through it on your own! Good job! I love having the Army move us...plus making a little money doesn't hurt lol. Great tips. I absolutely despise moving...even though the military does EVERYTHING for us. lol. We're moving from Mass to College station at the end of the year, and I am already dreading the process. I think it's unpacking I hate more than anything! We've never had to move ourselves yet. I'm not looking forward to it! We had to move ourselves on our last move too and we actually got away with not renting a truck!! We just asked the guys at hubby's work if anyone was free Saturday to come help and so many people had trucks, we never went and picked up the moving truck!!!! GREAT tips! However, now that we own a house and all the stuff that fills a 2,000 sq ft home I'd have no problem spending my hard earned dollars for someone else to move me! I'm hosting a swap that benefits mental health awareness - stop by to sign up! I gave done both, moved myself and paid someone. The paid help was very quick and cheaper they I thought they would be but totally worth it. Under 200 is impressive. I totally dread moving! I can't imagine having to move so much! I use suitcases to pack heavy things like books and dvds. That way you can just roll them! I also use t-shirts as packing/cushioning along with the towels and blankets. We are debating this next move if we will do it ourselves or not. The packing and unloading can be a bear! Barf. This whole comment section reads like a circle-jerk. "I Understand"... Do You? Do You Really?